The Winter Market brought some festive joy to St Margaret's House with our range of stalls including vintage clothing, hand-made jewellery, christmas cards, candles and much more. The market also supported WISH, with the £2 entry fee going towards this national, user-led charity that works with women with mental health needs in prisons, hospitals and the community. It was also a Winter Market with a difference as all of our sellers approach their craft in an ethical way. The products were also affordable, with a large amount being priced between £5-£10. As well as all of our amazing stalls, we had some brilliant classes take place that day. At The Create Place, there was a Herbal Blessings Clinic run by Rabiah Mali from 10AM-12:30PM. Attendees learnt how to make their own medicinal herbal balm and tea blend, which made a perfect gift for loved ones! There was also a Botanical Illustrations workshop run by Joanne Roberts from 2-4PM. This workshop was a brilliant chance to focus on natural plants that come alive in the winter. 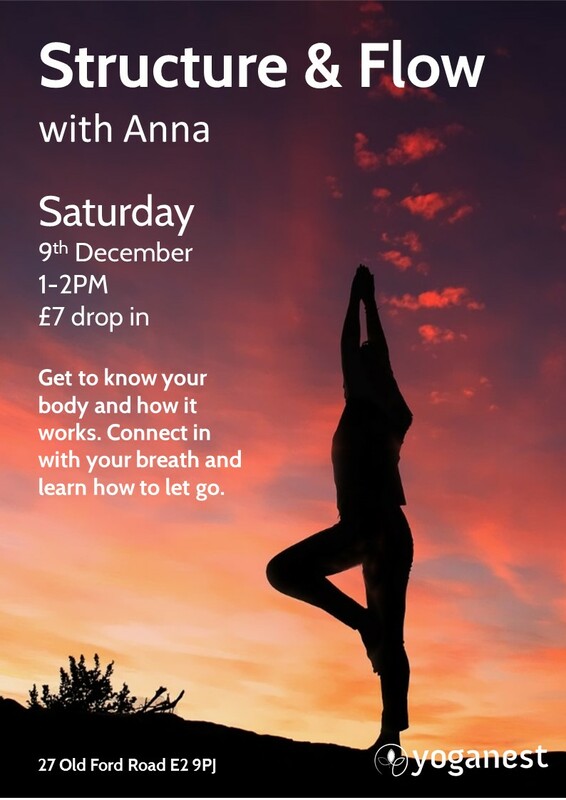 Yoganest also held a Structure and Flow yoga class from 1-2PM, and a Hatha & Yoga Nidra workshop just after at 2:30-3:30PM. Piki Dear is an independent illustration and design company set up by serial doodler Sophia Maria. Sophia creates custom portraits, illustrated greetings cards and postcards. Hand drawn cards and postcards are printed with trusted printers, MOO.com, on sustainable card using sustainable ink. 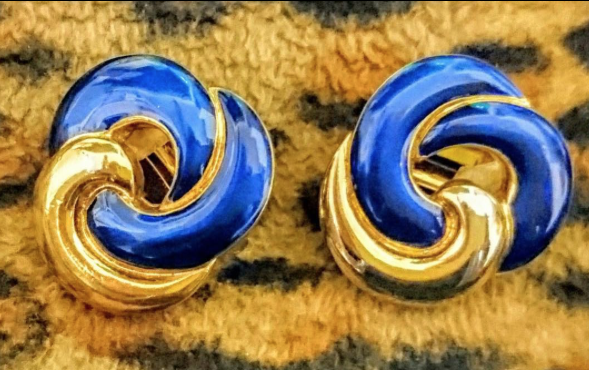 The jewellery is hand moulded, painted and gilded with real gold and silver; the designs themselves are completely unique, no two pieces the same, so they are the ideal gift for someone special. WeMakeBooks deliver bookbinding and book arts workshops and courses across London and the UK, including at our very own Create Places. Their aim is to promote the craft of bookbinding and the book as an art object in its own right. They sold their handmade notebooks as well bookmaking sets to help people who wanted to learn how to create from scratch. Ayoka is St Margaret’s House charity boutique and can always be found just next door at 23 Old Ford Road. Luckily their treasure trove expanded for our Winter Market and they sold even more, cheap-as-chips designer and vintage clothes. Moody Bright Designs was founded by Milou Stella and is a project that focuses on the customisation of second-hand items. 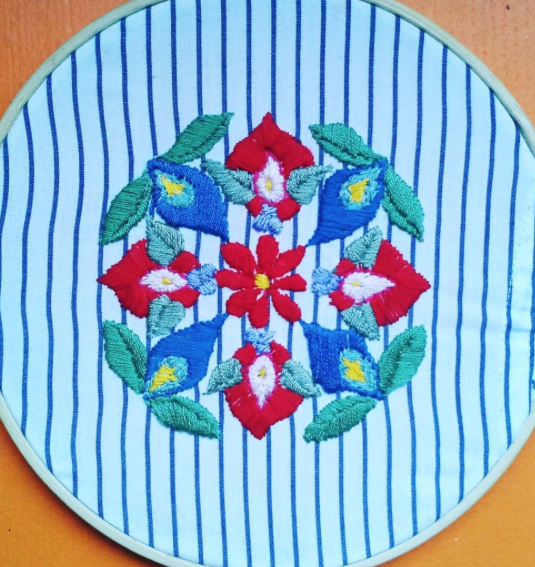 Drawing influences from 70s hippie and psychedelia aesthetics, floral and abstract designs, Moody Bright Designs up-cycles and sells textiles with unique, colourful folk-inspired motifs. Our market was the chance to pick up one of her creative designs! Scentimental Jars is a London based, independent candle company that creates vegan-friendly, scented, soy wax candles. They hand-make all their wax products and offer a wide variety of scents in a range of sizes at amazing value prices. The business was founded in 2016 by Luke Bevis, who came up with the idea while recovering from a heart operation, and then decided to start the company due to his love and passion for candles. Wish sold some beautiful scarves, handmade cards, vintage clothes, jewellery and accessories, with all the proceeds going straight into WISH charity. They provide independent advocacy, emotional support and practical guidance at all stages of a woman’s journey through the Mental Health and Criminal Justice Systems. Alleyhats have been creating quality, traditional cycling caps since 2005. 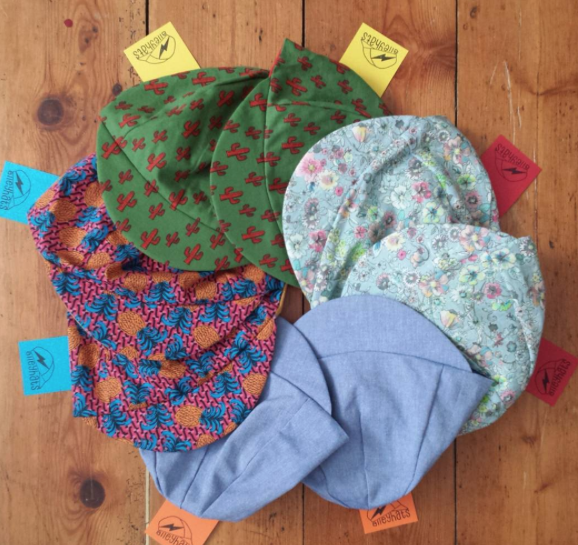 Their classic four piece, cycling caps are all designed, made and hand finished by Kate in South London, who has over ten years' experience of pattern cutting and, as a cyclist herself, understands the importance of a comfortable, machine washable, and durable cap. Alleyhats cycling cap is the perfect addition to your kit and, for those with a little cyclist at home, Alleyhats also make children's caps which are also available at their Winter Market stall. 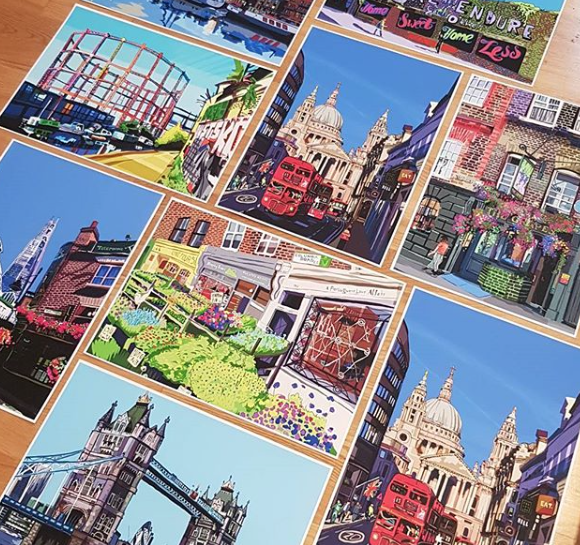 Tomartacus is the moniker of Tom and Jess Jones-Berney who exhibited their beautiful London prints in our cafe last summer. The brother and sister design duo from Hackney collaborate, with Jess taking photographs of the pairs’ favourite spots in London and Tom sketching them using a Wacom tablet, resulting in a unique brand of hand-drawn digital prints. This was one of our favourite exhibitions of the year and we're so happy they were a part of our Winter Market! Hand-painted, printed and designed in North West London, this colourful clothing is inspired by nature and patterns. 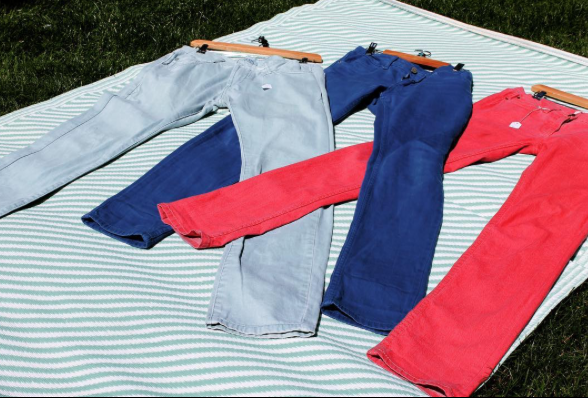 It is designed to bring fun and happiness into your wardrobe, meaning their items were ideal Holiday gifts! 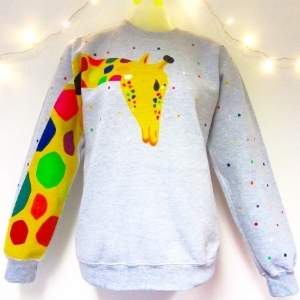 Morewalls is a small local business run by South London based artist Gabriella Rosenau. 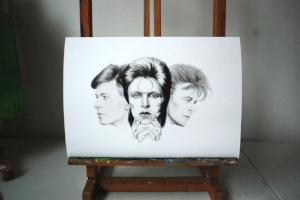 As well as selling her own original works and limited edition prints, she specialises in portraits, landscapes, hand painted furniture, murals and almost everything and anything else painting or drawing related! As well as our stalls, we also showed two of our favourite films in a baby friendly environment, inside our Chapel (next door to the hall). Studio Ghibli's 'Ponyo', started off the day! 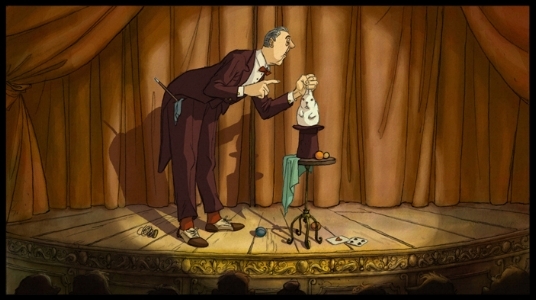 And then Sylvain Chomet's 'The Illusionist' finished off the day! Participants got to know their body and how it works in this Structure & Flow workshop. It was a chance to connect in with your breath and learn how to let go. This calming yoga workshop helped students stretch, ground and relax for the holidays.